Hiya enthusiasts! Wondering why Alert interface exists in Selenium WebDriver? Well, my friend, look no further than this post for the information you seek. We are going to talk all about popup boxes which are basically of three kinds – Alert box, Confirm box and Prompt box. As always we have our Demo Site to illustrate these concepts. In case a popup box appears on the web page, the user cannot perform any action on the underlying page as long as the alert isn’t accepted or dismissed. Beware, you might bump into “UnhandledAlertException: Modal dialog present” if you try to access any element on the web page with an alert. A simple alert box is usually used to pass on information to the user or to give some warning. The user cannot proceed further unless ‘OK’ button is clicked. A confirm box provides two options to the user in order to verify/accept or dismiss something. The user has to click either ‘OK’ or ‘Cancel’ to proceed. Boolean values are returned by the confirm popup box. It returns a true when the user clicks on ‘OK’ and it returns a false when clicked on ‘Cancel’. A prompt box is used in circumstances when we want the user to enter a value. Similar to other alert boxes, the user has to click either an ‘OK’ or a ‘Cancel’ button inorder to proceed further. Prompt box returns the input value when clicked on ‘OK’ and returns a null if clicked on ‘Cancel’. Hope you have a clear understanding of the different types of web-based pop-ups now. Selenium WebDriver hasn’t offered us any way to handle these popup boxes. Did you believe what I just said? Ha! I know there is no fooling you! WebDriver always has answers to all our problems. The Alert Interface which comes with org.openqa.selenium.Alert package!! This is the method used to switch from the main window to the popup or the alert that is displayed. This method is used to accept the alert. It clicks on the ‘OK’ button. This method is used to dismiss the alert. It clicks on the ‘Cancel’ button. To get the text displayed in the pop-up box, this method is used and it returns the text as a String. This method is used to enter a particular String in the displayed popup box, usually a prompt box. 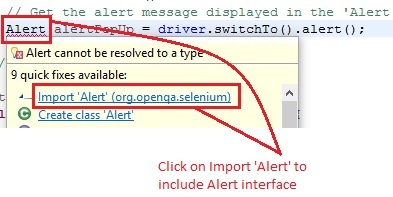 In order to instantiate a popup box, we will have to import “import openqa.selenium.Alert package”. Once we type the above code, a squiggly line appears below the word, ‘Alert’. Upon hovering, eclipse will suggest all possible quick fixes. Click on the first fix that suggests importing ‘Alert’ package. This package specifies the Alert interface which is used to used to handle web based pop-up box. Here ‘alertPopUp’ is the new instance variable created to reference the displayed pop-up. 3. To get the text displayed in the popup box, getText() method is used on the instance variable that references to the generated alert. 4. To accept the alert, accept() method is used. 5. To dismiss the alert, dismiss() method is used. In JUnit window, green bar shows that the test case is executed successfully. Console window shows the absence of any errors. It also shows all the printed messages as expected. Time to practice and I will see you soon in another post. Have a great day! The method is dismiss() but you have used accept() in the example. 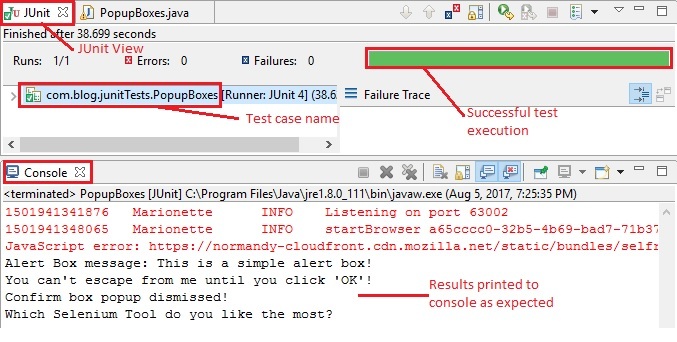 I have used this dismiss() method in the sample scenario for dismissing the ‘Confirm Box’ pop up. Hope that helps.